Buckwheat flour is a nutritious and energizing flour that is sourced from the flowers of the buckwheat plant, which is native to Northern Europe and Asia. Because it is free of gluten and wheat, it has become popular as a substitute to white or enriched flour, especially among diabetics and people seeking to lose weight. Moreover, many people simply enjoy cooking with buckwheat because of its robust and earthly flavor. Below is a recipe for making some delicious and healthy pancakes using buckwheat flour as the central ingredient. 1.) Mix together the flour, salt, and baking powder. Also, melt some butter in a small pan so that it is liquefied. 2.) Crack the eggs into a bowl, and then add the milk, maple syrup, and liquefied butter into the same bowl. Mix well until the liquids are nicely combined. 3.) Combine the wet ingredients with the dry ingredients using a large spoon. If the mixture appears too thick, then add a little more milk. This will result in a nice, fluffy pancake batter. 4.) Heat the pan and then lubricate it with some butter. 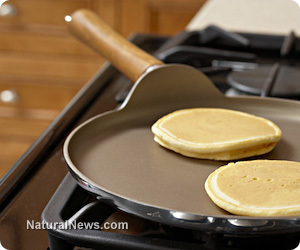 When you are ready, pour into the pan a quarter cup of pancake batter and heat on medium until you can see holes form at the top of the pancake. Next, flip over the pancake and cook the other side for another 15-30 seconds. 5.) Once the first pancake is ready, try and keep it warm (unless it is being served immediately) while you make more pancakes using the remaining batter. While pancakes of any sort shouldn't be eaten regularly, the ingredients used to make the pancakes above are healthier than their well-known equivalents. Buckwheat itself, for example, is excellent for our cardiovascular system because it contains a high number of flavonoids, which guard the body against disease by acting as antioxidants. These flavonoids also contribute towards buckwheat's well-known fat-lowering properties, since they prevent platelets in the blood from clotting and thus maintain a good blood flow, which protects against heart disease and cholesterol oxides. Michael Ravensthorpe is an independent writer from the United Kingdom whose research interests include nutrition, alternative medicine, and bushcraft. He is the creator of the website Spiritfoods, through which he helps to promote the world's healthiest foods, whether they be established superfruits such as mangosteen or lesser-known health supplements like blackstrap molasses. Michael is also the creator of the companion site Spiritcures, which details his research into the best home remedies for common medical conditions. Pancakes are my fav. I am going to try it this weekend.